Over the last few years, I've done a pretty good job of cutting down on processed and pre-prepared foods. I can proudly say I haven't had a Lean Pocket in probably three years (I used to eat one for lunch almost every day), and I no longer buy "crack snacks" (Doritos, Cheez-its, Pringles, and the like). But while it sounds lovely to eat only whole foods and make everything from scratch, I am not cut out for that. Sometimes I don't have time to cook; sometimes I don't have proper ingredients to cook with; and sometimes I just don't feel like cooking. So, I've struck a compromise with myself - I try to seek out prepared foods that are made with excellent, natural ingredients and infused with love. Yes, I do believe processed foods can be made with love. Take "Full of Life" Flatbread Pizza for example. I discovered these little gems in the frozen pizza section of Whole Foods. There was something about the picture on the front that just drew me in. Then I started reading all the verbiage on the box. I mean, there are words covering the front, sides and back of this box. And the print is small. I finally just threw the thing into my cart and decided to read the rest at home, so that it didn't melt while I stood there reading. "Handcrafted using locally sourced ingredients"
"Each week we shop at farmers markets and talk with growers, farmers, ranchers, and artisan food producers, so that we can offer diners the freshest seasonal ingredients possible." "All of our Flatbread Pizzas are produced by hand in small batches." "When people deeply care for what they are doing a nourishing environment exists that benefits us all." The list of ingredients reads like a recipe, with no artificial substances in sight. They even list the source of many ingredients, such as "Santa Barbara County Red Wine," and "Los Alamos Extra Virgin Olive Oil." And then there's my favorite part. On the back of the box is an entire paragraph dedicated to McFadden Farm, the farm that grows the organic herbs used on all of their flatbread pizzas. Guinness McFadden is the name of the man who runs this farm, which is described as a "quiet, pastoral place...a feast for the senses and soul." According to the box, Guinness started the farm after ten years as a Naval officer and a stint at Stanford business school. So now I know more about the man who grew the herbs on my pizza than I know about the moms I encounter during preschool drop-off three times a week. My Full of Life flatbread pizza was not only delicious (I bought the mushroom with caramelized onions & tomatoes), it was healthy. As I ate my pizza, I wasn't thinking about what a slacker I was for making a frozen pizza for dinner. 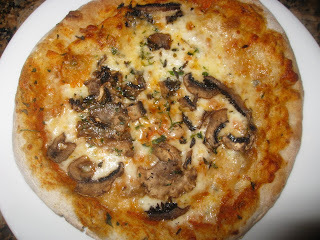 I was savoring each bite of the crispy vita-grain flour crust and Three Sisters Serena Cheese. And wondering what ole' Guinness was up to. Perhaps he was milling through his fields, pausing now and then to sample a bit of marjoram or oregano. I kind of want to hang out with that guy. How can you not want to hang out with someone named Guinness McFadden? "This Flatbread Pizza is the direct result of a great desire to feed, nourish, and share the good will, pride, integrity of all of the many people who make baking these breads possible... ...from our hearth to your table, this Flatbread Pizza is our small reflection that to eat good food is to be Full of Life!" This might sound a little strange, but that's adorable. And your post makes me not only want to try this pizza, but to support this company. Thanks Katie! If you can find the pizza you should try it. I really like their "white pizza" version too, which just has cheese & herbs. So yummy! i just stumble on your website.. and it is beautiful:) i have it book mark so will stop by soon. thank you for sharing this lovely story. have a nice weekend. That's why I eat Twinkies - they're totally filled with love. Or cream. Whatever. Sounds absolutely delicious and so far I love what I've read! 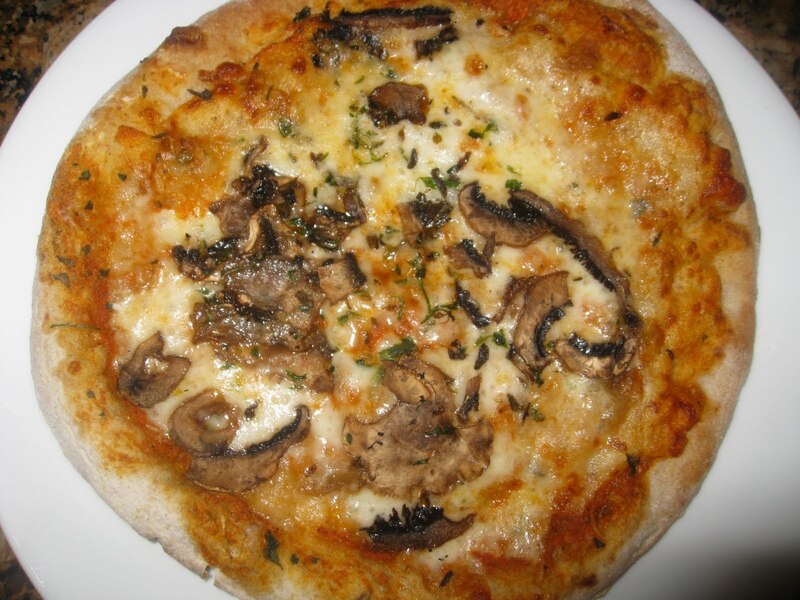 That pizza looks awesome and I will definitely get some the next time I'm at Whole Foods. Have you ever read Food Rules by Michael Pollan? You'd love it. He calls all processed food "edible foodlike substances"!